The final round of the Hinrich Trade Negotiation Simulation took place on Feb. 23, 2019, at the Jockey Club Hall Read more. The first round of the Hinrich Trade Negotiation Simulation was held at the Asia Society Hong Kong Center on Feb. Read more. The sun was just setting over Victoria Harbor. Cargo vessels and a Chinese junk boat passing by turned golden as Read more. It was the start of January when my fellow scholars and I decided to go to a strawberry farm. The Read more. Hinrich Foundation Research Fellow Stephen Olson provided insight on the US-China rivalry and way forward for both the countries post-trade Read more. Hinrich Foundation China Digital Trade report was quoted in an article by Global Times. The report, titled “The Data Revolution: Read more. 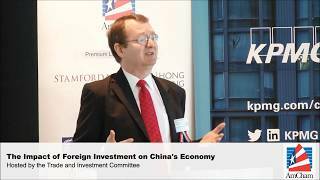 On July 13, 2017, author Michael J. Enright presented findings from a ground-breaking new white paper report on the impact of U.S. foreign direct investment (FDI) and U.S. companies on China’s economy. The event was held by the American Chamber of Commerce in Hong Kong and attended by members across the government, business and academic sectors. The Hinrich Foundation has released its first video on a Developing Country Sourcing report - Philippines Sourcing: Furniture 2017. The video highlights the industry’s major production hubs, raw materials and manufacturing processes such as weaving, carving, painting and inlaying. It also gives a glimpse of factories in Cebu. To download the full report and find products and suppliers, visit Developing Country Sourcing.